Even though pictures of the LFA have been circulating for years, and personally I’ve seen the car in the carbonfibre before, nothing prepares you for the sight of the Lexus on home ground, mixed in among everyday traffic. In our collection there are more beautiful shapes and brighter colors, but without a doubt the most striking shape is the LFA. It looks like it has arrived from Mars, circa the year 2050. This white LFA pre-production prototype is starting to show some wear after some very tough miles. The other three cars are equipped with launch control systems, which practically guarantees a solid launch. The LFA, on the other hand, requires more technical skill. After all, it did take Car & Driver some experimentation to hit their reported 3.7s time, and that was with a different prototype. Unfortunately, neither of these facts are mentioned in the article. Nevertheless, this article only highlights the need for launch control in the LFA — if only to even out the playing field and make for more accurate comparisons. 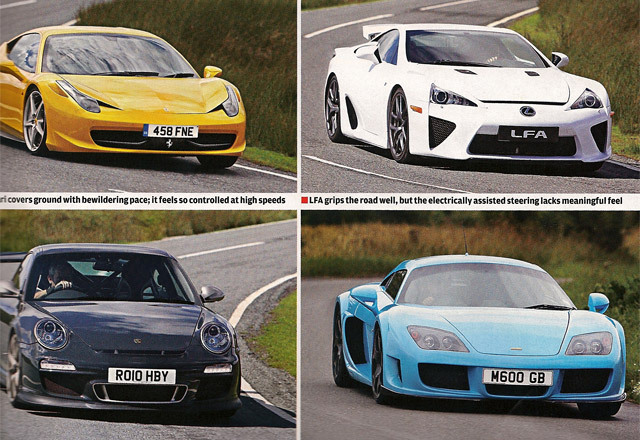 Update: This comparison is from Autocar, not Car Magazine.